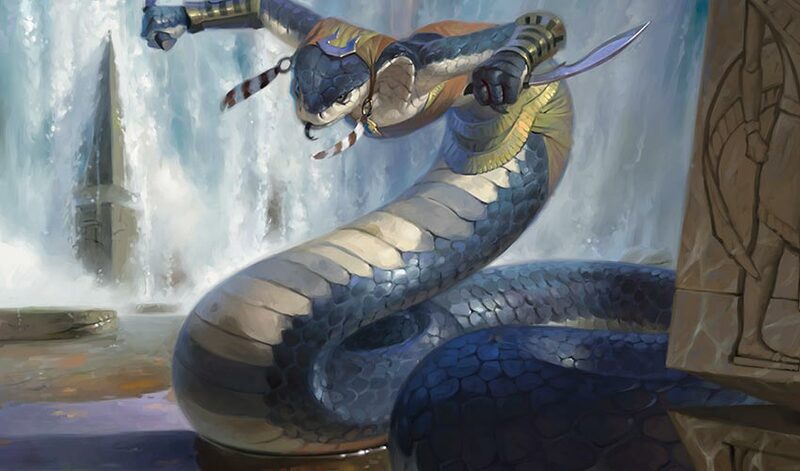 The Gatewatch had come to Amonkhet to uncover the machinations of the malicious dragon Planeswalker Nicol Bolas. What they found instead was a flourishing civilization at the height of its power, watched over by benevolent gods. While Gideon Jura had many lingering questions about the world, the presence of the divine most captured his attention and curiosity. I walked quietly along the path, following in the wake of Oketra. The god glided ahead, footsteps fleet against the limestone road, calm radiating from her presence in near-palpable waves. The relentless glow of the two suns overhead glinted off the tips of her ears and refracted into dancing dapples of soft light that flickered across her path, catching off the gleaming buildings and triumphant monuments that made up Naktamun. People turned as we passed, feeling Oketra's presence before seeing us. I marveled as they nodded their heads and smiled in deference, and my breath caught in my chest as she bowed her head in return, soft murmurs of words resonating low, rumbling so only their intended recipients could hear them. There was no groveling, no fear from the masses before an almighty presence. She spoke with the people, her gaze piercing and warm, bringing reassurance and encouragement. A child ran up to her, placing a shy hand on her robe. She paused, bending like a reed to pass one giant finger across his dark hair. I watched as he mumbled something, his face nearly buried in the fabrics, some worry or fear furrowing his brow. Oketra smiled, radiant and kind. The boy looked up, their eyes met, and the boy's worry melted away, replaced by a smile and a determined nod. He turned and ran back toward his friends, the excited whispers of what he received sending the others into a flurry of head rubs and back pats. And yet, in the back of my mind, Chandra's mistrust and Nissa's curiosity nagged at me. They were right to be cautious. 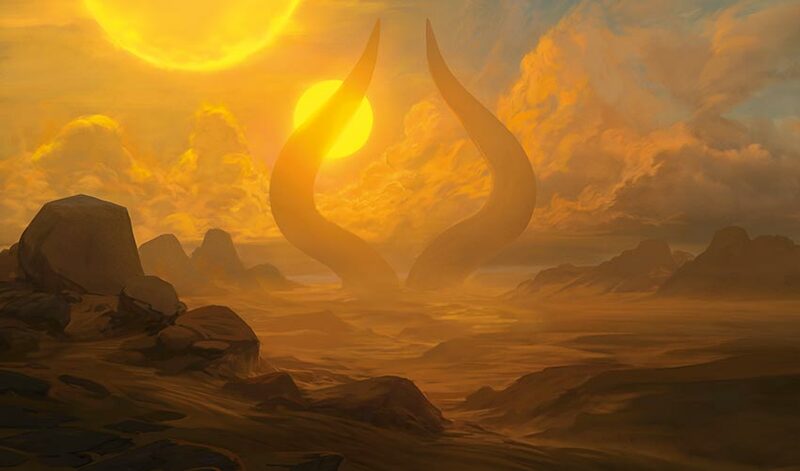 This world belonged to Nicol Bolas, and despite his current absence, his presence lingered over everything. I glanced at the massive horns in the distance, visible through the closer buildings, a looming silhouette marring the horizon. I caught snippets of conversation as I trailed behind Oketra, and occasional mentions of the God-Pharoah—"May his return come quickly, and may we be found worthy"—floated by. The whole city had a rigidity and structure that was simultaneously impressive and worrisome, a confluence of achievement and glory against a lingering unnaturalness and unease. But then there were the gods . . . I shook my head. I'm thinking myself in circles. I realized my thoughts slowed my steps and looked ahead. Oketra stood, stopped in her path, looking back. I broke into a light run to catch up. An unfamiliar weight bounced against my chest as I ran, and my hand reached up to the gold and blue cartouche hanging around my neck. The first step in your journey through the Trials, Oketra had told me. We rounded a corner and I found myself standing before a large square filled with people. Men and women, aven and jackals, as well as a few naga and minotaurs all caroused around long, low tables, while numerous anointed meandered through, carrying large platters piled high with a dizzying array of foods. I noticed all these initiates had cartouches with three segments. A celebration, before the next Trial. I looked up at Oketra, and her blue eyes met mine. "These crops now prepare for the Trial of Ambition." Oketra's eyes were unblinking, yet her stare soothed rather than unnerved. "If you truly seek to embark upon the Trials, this is where you will begin." I bowed my head in affirmation. Oketra smiled and returned a nod, and we turned back toward the initiates. They had taken notice of Oketra, and many nodded or kneeled in reverence, wearing the smile of one who had just seen an old friend. One young man stood from his seat, looking up at her, then grinned as he jogged toward us, answering the unspoken beckoning of the god. "Greetings, Kytheon! I am Djeru of the Tah crop." The young man clapped his hands on my shoulders, his eyes gazing directly into mine, alight with a smile, and kissed me on both cheeks. I fumbled slightly to return the greeting. "You can call me Gideon. Some find it easier." Djeru dropped one arm and leaned in conspiratorially. "But what is the name on your heart?" I paused. "For a long time now, it has been Gideon." The warmth of Oketra radiated beside me, and I frowned. "I am less certain." Djeru laughed. "You're a puzzle, then. I enjoy puzzles." I leave you to this Trial, Kytheon. I looked up, but Oketra was already gone. Djeru shook his head, his smile wide as ever. "I will never grow used to how Oketra moves. 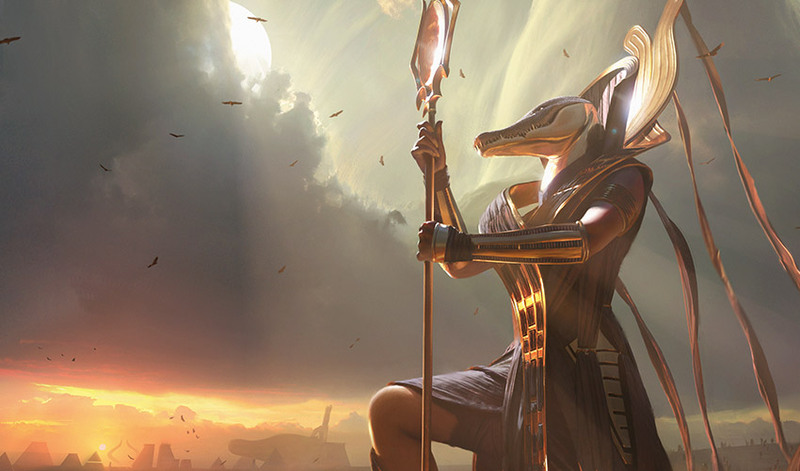 A golden blur, a beam of sun from the God-Pharaoh himself—may his return come quickly." "And may we be found worthy," I answered, a half beat slower than by reflex. But Djeru didn't seem to notice as he steered me toward the celebration. "You must be special indeed if Oketra herself has brought you to us. The timing is also quite fortuitous! Just yesterday, our numbers were reduced by one." A slight flinch in Djeru's grasp on my arm caused me to search his face, but he revealed nothing more behind his wide grin. "If you are to embark on Bontu's Trial with us, perhaps you can help our crop regain our balance." Without warning, Djeru thrust a leg out in front of me, one hand still grasping my arm as he shoved me with his other. I stumbled but turned in on reflex, pulling my arm free as I pushed a hand against his chest, shoving him back. We stood and stared for a moment. Then he raised a hand and gave a short beckoning wave. A slow smile spread across my face. We sparred briefly, exchanging a flurry of blows. Djeru fought with a strength and focus belied by his earlier jovial attitude, and before I knew it, his grappling style landed me on my back. The same broad smile returned to Djeru's face, and I laughed. Too much time punching and slicing through gearhulks and sandwurms, not enough time fighting hand to hand. Djeru hauled me to my feet. "You're good. You could be better. Come." Djeru escorted me around the celebration, gesturing to the wide array of meats and foods. He pointed out the various games being played—mancala, senet, a game bearing the name of the god Rhonas. I watched as initiates bantered and cheered, bet against one another in the games, and broke out into occasional friendly sparring matches. It reminded me of Theros, of home, of my youth. "I haven't seen such celebration in some time," I said to Djeru. Djeru nodded. "This is indeed a rare treat. Where the other gods had us in near-constant training for their Trials, Bontu instructs only to 'prepare ourselves.'" He caught my eye. "But of course, all in life is ultimately training and preparation for the Trials, and for the return of the God-Pharaoh." "May his return come quickly," I muttered. "And may we be found worthy." Djeru's seriousness lifted. "But come, friend. If you are to join our crop, we'll need you to meet the others!" With that, Djeru brought me toward a small group seated around a low table loaded with overflowing platters of fruit. Names were introduced, faster than I could remember them all—Neit, Dedi, how did that minotaur pronounce hers?—and quickly, Djeru turned the conversation toward the events of the Trial of Solidarity, and how each person at the table contributed to their success. "Setha and Basetha's speed played to our favor, as they dashed across the grounds and retrieved Oketra's arrow while the rest of our crop defended the obelisk." Djeru gestured to the two jackals sitting together, clearly twins. Sharp grins flashed under black fur. "How did your crop complete the Trial?" a naga woman, Kamat, asked me, her tongue flickering. "I . . ." Something told me the answer "I didn't" would not be well received. I gazed around at the seated initiates. All wore cartouches with three segments, unique in design but similar in length and complexity. "You do not have to say." Djeru came to my rescue. "Forgive Kamat's directness. Our crop's success sometimes lets us forget that not all make it through the Trials without losses. Her words cleave as straight as her blades in battle." "Unless you're a hydra," someone muttered, and all broke out in laughter. Kamat made a show of looking about for the offender, and playful shoves abounded. I looked to Djeru. "Losses." Djeru nodded, a smile still on his face. "Many other crops are culled significantly from Trial to Trial, and reformed with others. You are not alone, my friend. But we of Tah have been strong to have remained one unit since the beginning. Save, of course, the one who you are replacing." Djeru hardly paused, but I noticed the rest of the crop avert their eyes for just a moment. 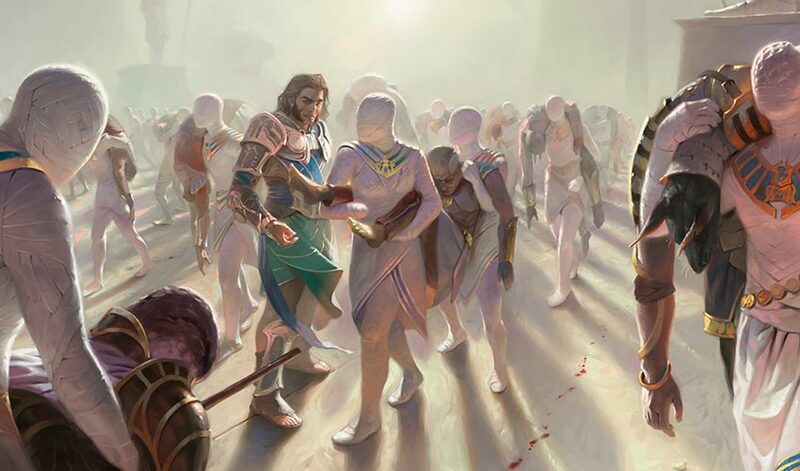 "Of course, we look forward to greeting all our fallen brethren as they are restored upon the return of the God-Pharaoh," a woman interjected. "May his return come quickly, and may we be found worthy!" The chant came as a roar from the rest of the crop. "Kesi is right, of course. But come! These rabble-rousers are, fortunately, not all we have to offer." Djeru again steered me away, his comrades shouting out in mock protest as we meandered across the square. My mind raced as we walked, trying to piece together all this information. I had myself witnessed the dead returning to life on this plane, but the way Djeru spoke of the fallen returning sounded different. Restored, he said. Was this true—or even possible? Djeru didn't let me stew in my thoughts. We approached another group of initiates standing a little further from the crowds. "This is Meris, Imi, and Hepthys." Djeru gestured to the trio. "And this is . . . Gideon. He will be joining our crop as we embark on the Trial of Ambition." The three nodded in greeting, and once again I couldn't help but notice how young all the members of the crop seemed. Meris couldn't have been older than sixteen—and yet, his eyes held some smiling secret, aged and wise beyond his outward appearance, bittersweet and a little sad. Beside him, Imi seemed positively radiant, standing barely taller than Meris, dark hair cropped at shoulder length in a cut that I had seen on many others yet somehow seemed to uniquely highlight her beauty. The two of them stood close, their intertwined hands erasing any questions their shared looks and subtle smiles may have left. Hepthys's expression was harder to read—mostly because I had little practice reading aven expressions. He held himself with a poised grace, wings folded neatly behind him. "Meris is the main reason for our success in the Trial of Knowledge." 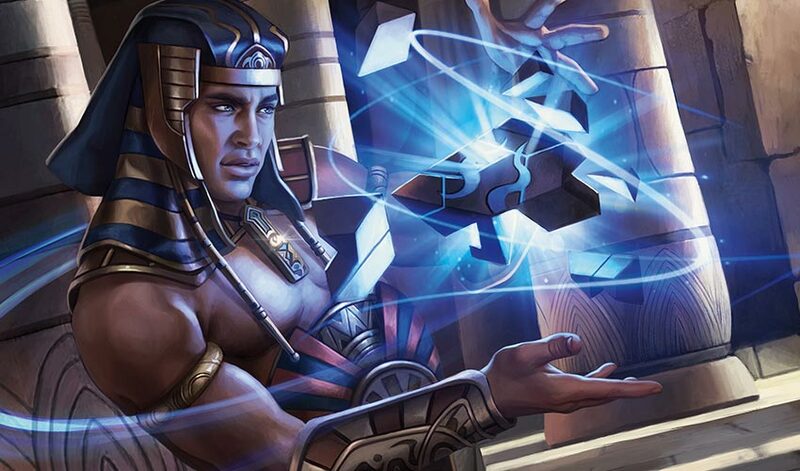 Djeru gestured widely, but Meris was already shaking his head. "Our success was only possible with Djeru and the rest providing me the space and time needed to think," he said. Djeru smiled and gave Meris a light punch on the shoulder. "Our next Trial is of Ambition, not deference, Meris. None of us could have unraveled the final illusion with the speed and certainty you did." Meris started to reply—when a commotion behind us drew all our attention. I turned to see a woman lift a minotaur overhead with a roar, then throw him tumbling to the ground. The initiates crowded around them cheered, some grumbling and handing over jewelry and gems to others. "And that is Tausret. One of our finest warriors." Djeru beamed with pride as the woman circled the crowd, shouting for other challengers. "Only you stand stronger," Meris commented. Djeru began to object, but Meris cut him off. "Ambition, not deference, Djeru." Djeru broke into a grin. Meris nodded, nonchalant. "Yes. You, and perhaps Samut." A chill instantly befell our group. Djeru's face dropped. Hepthys and Imi looked away, bodies tensing in the silence. "We do not mention the name of the lost." Djeru glared at Meris, who, to my surprise, returned the stare. "I will name her if you will not. If this initiate is to replace our sister, he must know the role Samut served." Meris fixed his gaze on me. "Can he replace our fastest runner, faster even than the jackal twins? Is he a warrior fit to rival you in skill and strength, who can take down a manticore practically by himself, as Samut did in the Trial of Strength—"
"We speak. Not. Of the lost." In a blink, Djeru stepped in, hand clenched around Meris's cartouche, pulling him close, his face locked in a scowl. Imi, Hepthys, and I all stepped in to intervene, but Meris held a hand up, and the others backed away. I chose my words carefully. "I seek not to replace anyone, Meris. I cannot. I can only offer who I am. And Djeru, I am sorry for your loss. It seems Meris is mourning her death differently, and needs to—"
"Oketra may have suggested you join our crop, Gideon, but clearly she did not tell you of our circumstance." Djeru held me in his stare, suspicion in his eyes. Finally, he sighed and let go of Meris. "I am sorry, Meris. My anger overrode my better sense. You are, as is often the case, correct. We should give Gideon some context." Meris nodded and again looked at me, dark brown eyes peering into my own. "Samut is not dead," he said. "She is lost. But she chose to be." My confusion must have shown on my face. "She is a dissenter," Djeru added. The others winced at the word. "Ah. I see," I said, trying to cover for the fact that I did not at all. "It still sickens me to say it so plainly." Djeru spat, sullen and upset, and walked some distance away from us. "We do not know why she fell to such heresy." Meris spoke quietly. "But she did. And so, she was removed. Her loss not only weakened our crop significantly—but she and Djeru had been closest friends, since even before the Ceremony of Measurement, when they were but mere children." I looked at Meris, Imi, Hepthys. You're all still children. "Djeru has taken her loss the hardest." Imi spoke up, her voice soft and soothing, honey melting in the heat. "Death would have been better—even a dishonorable death—for dissenters have no place in the Afterlife." She looked to the lower second sun, hovering just beside the great horn statues in the distance. "And we're so close to that glorious time now. The Hours are almost upon us." A memory leapt to mind. A young woman, pushing her way through a crowded street, shouting as she was pursued by soldiers. "The gods lie! The hours are a lie!" "This was . . . recent, then." I looked to Imi, then to Meris, who gave a curt nod. "I . . . I think I saw her." Djeru waved his hand. "Enough. You know now. Let us speak no more of this." I started to object when a sudden hush fell upon all the initiates. A lengthy shadow befell the square as a great form stalked toward us, flanked on all sides by figures adorned in black. The larger sun burned low in the sky, and I squinted against the darkened silhouette haloed in the red light of late afternoon. My eyes took in what could only be another god—towering in height, human in body but with the head of a great and fearsome crocodile, her long snout turned into a sharp grin. She stood, surveying all before her, a mighty staff in one hand, black robes draped over her imposing form. As she approached, an aura of divinity washed over me. Yet the feeling that stirred in my chest did not echo the warmth and calm of Oketra, instead invoking a surge of pride and power. I noticed none of the initiates bowed their head as with Oketra—instead they stood taller, shoulders back, proud and eager to catch her eye. Beside me, Hepthys ruffled his feathers. "This is . . . unusual," he murmured. "Can you recall the last time we saw Bontu walk the streets of Naktamun?" Imi shook her head. "It must be because the Hours are nigh." A rumbling hiss swelled, growing in volume, until I realized it was Bontu's voice, reverberating across the square. "Time draws short," she rasped. Every face in the square was turned toward her now. "Not all will have the chance to earn my favor. Who deserves to compete in my Trial?" A burst of noise exploded from the assembled initiates, roaring assertions of their worth. Bontu's smile widened. "Only the strong will triumph. But strength is learned." Narrowed eyes surveyed the raucous initiates. "None are born strong." I felt a surge of fearlessness in my heart. Emboldened, I stepped forward, shouting above the fray. "Not even the gods?" Voices fell by the wayside as a series of gasps and mutters broke out. I felt many eyes turn back to look at me, but held my gaze up toward the beady eyes of Bontu. Her great head tilted, and her eyes blinked at me—one lid, then the other. Ivory teeth, each the length of a boat, appeared—and she laughed, a hideous hissing that echoed in my gut. She turned to address all the initiates in the square. "Even I am greater than I once was," she rasped. "Because I desired to be so." Her words were answered by murmurs of admiration and acceptance. Bontu raised her hand, and a hush fell as she pointed a finger at me. A shiver ran down my spine as she named me. She held her hand suspended in my direction for a moment, then slowly, her finger drifted to all the members of Djeru's crop, naming each member as she pointed. When twenty names in all were called, she dropped her hand, ever slowly, ever full of purpose, by her side. "Initiates of the Tah crop. You shall be next to face my Trial." With that, Bontu turned and left, her viziers gliding away beside her in stony silence. I let out a sigh and realized I had been holding my breath. Others in Djeru's crop approached, cheering and expressing thanks and praise. Djeru came by my side, a wary smile crossing his face. "Looks like Oketra was right to have you join us after all." With that, he grabbed and thrust my hand in the air. Around me, the roaring cheers of his—my—cropmates danced across the square. As they pulled me toward more food and drink, I couldn't help but notice the scowls and envious stares of other initiates. The Trial of Ambition has already begun, I suppose. The thought lingered as the rest of the evening passed in a blur of mirth, stories, and celebration, all under the strange, impossible red glow of the second sun. We hardly slept. 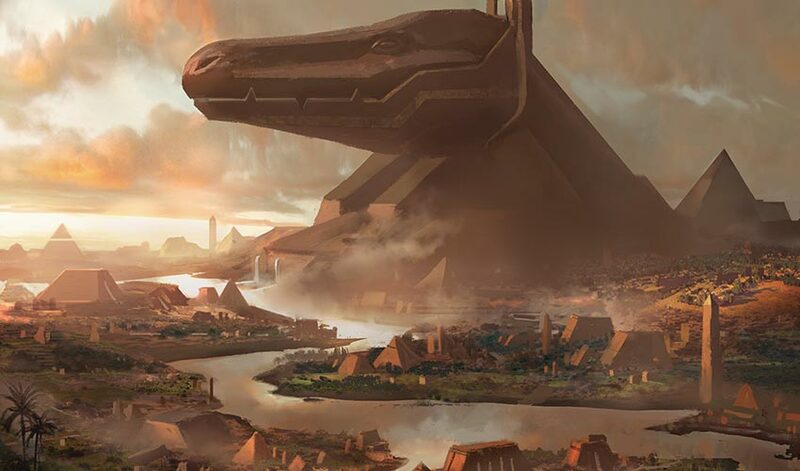 That morning, with the rising of the larger sun, Bontu's viziers ushered us into her monument—a massive pyramid bearing her form on the exterior. I had little time to admire the architecture though, as once inside, we were armed with simple weapons by the viziers and immediately led deep into the monument's heart. After a series of dizzying and confusing hallways, we emerged in a wide chamber lit from a strange golden glow that seemed to come from the ground itself. To pass the Trial, the viziers explained, we had to progress through the monument and ascend to the peak, where Bontu herself awaited—but not for long. "Bontu has no patience for dawdling supplicants," a vizier told us, cold and impassive. With that, the viziers vanished down the hallway that led us there, a stone wall sliding up behind them. Had I not just seen the wall lock into place, I would never have guessed there was an opening there. We turned and looked about the room. Our first obstacle seemed straightforward enough. A large pool of filth separated us from the one hall out of the chamber. The other initiates fanned into a defensive formation as Djeru and Meris scanned the room for some way across the ichor. In short order, Meris spotted a crank jutting just above the surface, near the center of the pool. "Dedi. Investigate," Djeru said. Without hesitation, Dedi stepped forward, removed his sandals, and waded into the muck. As Dedi pushed forward, Djeru spotted my questioning glance. "Dedi is one of our tallest. He is also one of the weaker of our crop," he quietly explained. "This is an easy chance for him to shine and demonstrate his worth." We watched Dedi struggle toward the center, the viscous filth rising to his neck in parts. Some in the crop grumbled about the slowness as we waited, but then Dedi was there, turning the crank, and slowly, a chain link bridge rose from the muck. A few initiates barked shouts of encouragement for Dedi as he began wading back to us, while Djeru led us toward the bridge. We had just started crossing when Dedi's screams cut through the air. At first I thought some creature in the muck was attacking Dedi as the dark liquid started to bubble and churn. We sprinted across the bridge toward him, and two initiates dropped down to reach for his hands and hoist him up—just as panels along the walls burst open and more filth spilled into the chamber. The level of the pool rose with unnatural speed, and the two initiates who had crouched down jumped back up, pulling hands back as if burned, violent red boils appearing on their arms where the sludge had touched them. I watched in horror as Dedi reached a desperate hand toward us—and skin and flesh sloughed off his forearm, revealing bone. Dedi's screams shifted as terror mixed with pain, and then the others were shoving me across as more filth poured into the chamber, overflowing the pool and corroding its way through the chains of the bridge. We leapt the remaining distance to the hallway beyond just as the bridge snapped, one side breaking away and melting into the muck. I rolled across the threshold, Dedi's screams and pleas cut unceremoniously short by a thick stone door that slammed down behind us. I stood, staring at the stone door, stunned. I reached toward the barrier, but Djeru stayed my hand. "We press on," he said. Already, the rest of the crop marched forward through the narrow hall. I stared at him. "But he was still alive –"
"Ambition does not retreat," growled Tausret from the lead. "You dishonor him by lingering." "Dedi died a glorious death. We will thank him for his sacrifice in the Afterlife." Djeru pushed passed me, and within seconds, I was the last one in front of the door. A glorious death? I clenched my teeth. Nothing about Dedi's death felt glorious. We walked on in silence. Grim faces, sullen atmosphere. They had not lost anyone in a Trial before this, I remembered. And yet, here we are, minutes into the first obstacle . . .
What were the gods testing for? Why would Oketra guide me to this Trial? We entered another wide, low-ceilinged chamber that extended quite some length. The room was flat and featureless, save for a strange, dark creature crouched near the center. "An ammit," Imi hissed. All the others hastily drew their weapons. "What's an ammit?" I asked. Djeru looked incredulously at me. "Soul devourer. A demon. Near impossible to kill. Our best bet is if it doesn't notice us—"
As if on cue, the creature raised its head and stared at us. From a distance, it looked like an enormous lion—but its head ended in the snout and mouth of an alligator. It also was easily three times the size of even the monstrous lions of Bant. Beady red eyes glowed from its thick skull as it lumbered to its feet. Djeru cursed, then immediately began issuing orders for an improvised plan. The reason for his haste became painfully clear as the ammit charged us, moving at a stunning speed for a creature of its size. We scattered, archers letting arrows fly as the rest of the crop made a dash across the room. Rather than confront the monstrosity head on, we ran for the other side in groups of two to three, with different teams trying to distract and confuse the ammit while others dashed by. Meris and Imi made it past as the ammit chased Neit and Tausret across the chamber. Two archers then pulled the ammit's attention away long enough for those two to turn and dash for the corridor on the other side, the only visible exit. The ammit ran between the groups, unable to make up its mind on who to chase, confused in the chaos. With a nod, Djeru and I started our run across. We were nearly at the exit when a gruesome sound pulled my attention back. One duo had gotten cornered, and with one powerful bite, the ammit had caught an initiate in its jaws. Her screams echoed in the chamber, followed by the wet sound of blood splashing against stone. Her companion scrabbled past, abandoning her friend. I sprinted back toward them, ignoring Djeru's protests fading behind me. Another scream rang out then cut short as the ammit bit down, and the nauseating smell of blood and viscera wafted across the chamber. Others ran by me as the ammit seemed completely engrossed in its victim, content to let the others flee. With a yell, I charged, my sural unfurling and slashing at the demon. To my surprise, the blades didn't cut through, instead glancing ineffectively off its thick hide, leaving little more than angry red welts on its skin. The monstrosity turned and bellowed at me, blood and spittle spraying from its open maw. It swiped at me with a massive paw, catching across my chest. I smashed backward hard against the wall. I stumbled up, blinking away the stars flashing before my eyes as the low growl of the ammit pounded against my skull. Golden ripples of light danced across my body as I focused my magic—and not a moment too soon. The ammit struck with lightning speed, its jaws a blur. I threw my arms up, and its teeth crashed against them, sparks of golden light flashing as it failed to pierce my shields. I squared my feet and pulled, intending to throw it against the wall. I strained with all my strength against it, but the ammit held—and started gaining ground. 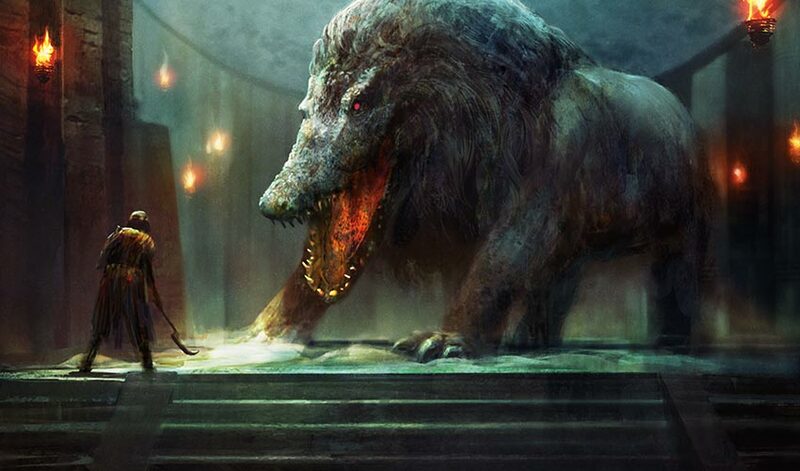 My feet slid against the stone, unable to find a hold as the ammit dragged me back, its jaws clamped onto my arm with an unrelenting vice grip. My skin shimmered with golden light, protecting me from being pierced by its teeth, but I couldn't free myself from its monstrous grip. Panic seeped in at the edges of my thoughts, my mind racing for a plan. I couldn't overpower it. Sure, it couldn't pierce my barrier, but I also had watched devour a person in two clean bites. My sural couldn't cut through its hide. I was running out of options. My feet slid again on the floor, and the ammit twisted its head, throwing me against the wall. The sound of cracking stone reverberated up my spine, and again as the ammit thrashed about, slamming my body against rock, knocking my breath from my chest. My head spun, vertigo setting in. I gritted my teeth. If I couldn't slip from its grasp any other way . . .
A loud screech cut across the chamber, and a gust of wind slammed into the ammit. The monster let go, more out of surprise than injury, and I rolled back. As I sprang to my feet, another burst of air brushed past me. Hepthys, last to cross, walked toward us with hands raised, muttering another incantation. "Run! Now!" Hepthys fixed me with a piercing stare as he sent another volley of cutting wind. The ammit roared in defiance. "You can't face that thing alone—" My protests were cut short by the dark blur of the ammit sprinting past me, barreling toward Hepthys. The aven spread his wings and leapt into the air, barely evading the ammit as it ran past. "Go, you fool!" Hepthys's wings flapped wildly as he flew higher, and I turned and sprinted toward the far corridor, past the ammit now turning around for another pass. A squawk and the sound of teeth tearing flesh cut my words short. I turned to see the ammit falling from an impossible height, its mighty leap just high enough to clamp onto one of Hepthys's wings. The ammit's teeth sliced through bone and tendon and it landed with a ground-shaking WUMPH, swallowing its prize in two snapping bites. A torrent of blood dripped down as Hepthys wobbled in the air, then plummeted toward the ground. The ammit approached slowly, savoring its prize. My feet carried me forward on reflex even as my mind froze, suspended in disbelief. I barely registered that I had made it across and into the corridor itself until I nearly ran into Djeru, who stood with about half the crop in the semi-darkness, peering ahead. "There's bladed pendulums ahead," Djeru said, and for the first time I noticed the strange whirring sound. The corridor was dark, with no light source, but from the ambient glow of the room behind us, I could just make out blurs of something flashing by in intervals. Djeru shook his head. "The corridor narrows, and soon only one can cross at a time. The first few have already made it across, but the blades get faster with each person that passes." "Djeru. Hepthys has fallen. We must—"
Djeru grabbed me by the arm, cutting me off. "What is wrong with you?" Anger seethed across his features, the mask of a calm leader suddenly broken. "You have lost your entire crop in previous Trials, and yet you treat each glorious death a tragedy. Your façade of heroics and rescues does nothing but insult and diminish our cropmates' sacrifice and bravery." I fell silent, stunned. I glanced around at the other initiates, but the shadows in the corridor hid their faces from me. Djeru pushed me away and barked out a list of names, calling members of the crop forward. One by one, he sent them down the corridor. I realized as they ran forward through the swinging blades that he called the runners based on speed. No hesitation, no question, no need for thought from him or those he named—he knew everyone's abilities by heart. I took a deep breath, trying to center myself. You are a stranger to this world, Gideon. Things are different. Death is different. I shook my head. Leave your judgment behind. Instead, the image of Hepthys falling played over and over in my mind, matching the cadence of the swinging blades ahead. I watched the initiates run by the blades. 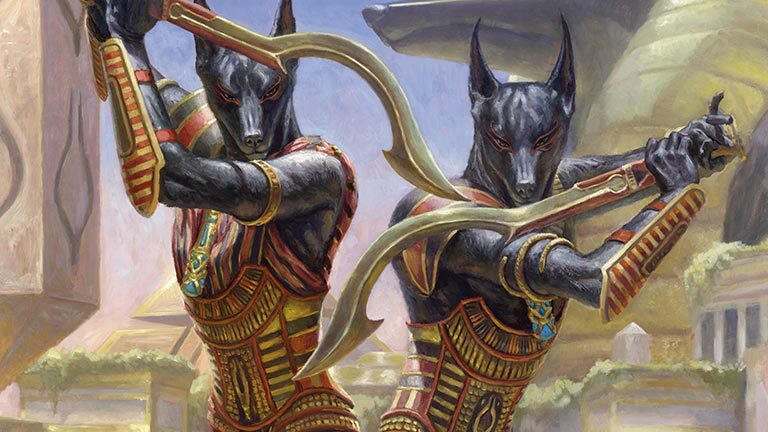 Soon, only Djeru, the jackal twins Setha and Basetha, and myself remained. We stood in silence, the only sound in the corridor the maddeningly rapid whirring of the blades. . . .the only sound. I suddenly realized the noises of the ammit had stopped. I spun around. The chamber behind appeared empty, except for a few bloody stains across the grounds. Djeru noticed too. "We need to go. Now." He nodded toward me—just as the ammit came barreling around the corner, squeezing down the corridor and roaring as it charged toward us. It was just large enough that its shoulders scraped against the stone walls, but with effort it pushed in after us, jaws snapping. At a command from Djeru, Basetha dashed down the corridor, followed by her brother. They made it several spans down the corridor—and then the damp metallic smell of blood burst over us as a rogue blade reduced Setha to a black and red smear of viscera. Basetha kept running, whether through bravery, ignorance, or sheer force of will, and joined the others down the corridor. But now the blades swung at impossible speeds. Djeru drew his khopesh sword, crouching to take a final stand against the approaching ammit. I took a deep breath, sending golden light shimmering across my body, and stepped forward into the blades. The first one smashed into me, shattering and launching me into the wall, stone chips and shards of the blade flying everywhere. Djeru ducked and turned to stare at me for a split second—then sprinted after me as I continued down the corridor, the snapping jaws of the ammit close behind. By the time we made it to the other side, my whole body felt like one giant bruise, and Djeru bled from a series of cuts from the shards of broken metal. The rest of the crop, to their credit, had already wisely moved away from us and into the following room. I fell to my knees, but Djeru was beside me, pulling me up and away. As we ran toward the center of the chamber, Djeru spoke between labored breaths. "I've never seen anyone do anything like that, mage or warrior." He peered at me, suspicion heavy on his brow. "It is a gift and a curse." Dark memories gnawed at me. Djeru shook his head. "You are still a puzzle. I'm not sure I enjoy this puzzle anymore," he said. I wanted to respond, but Meris was already explaining to the rest of the crop the discovery he made about this room. ". . . need four to stand atop those pillars to open the main door." Meris pointed to the four pedestals around us. He then shook his head. "But my guess is that will also unlock something . . . unpleasant. And they'll likely need to stay on those pillars to keep the door open." "The ammit is coming and likely to make it through the corridor since Gideon, uh, disabled the blade trap." Djeru looked at me, then back toward the roaring and scraping sounds as the ammit pushed its way closer. There was only a moment of hesitation, then four initiates walked toward the pillars. But Djeru grabbed the hand of one. "Masika. I need you to switch with Tausret." The two singled out by Djeru look at one another and reluctantly agreed. Tausret joined the rest of us as Masika walked to the pillars. Djeru was grim. "Tausret is one of the strongest of those of us remaining. I don't know what's ahead, but we can more easily lose Masika than Tausret"
"Let me stay." I looked back at the four. "I could—"
"Where is your ambition?" Djeru spat the words. "Would you throw your life away to prolong the fight for three, and abandon the rest of your crop who will need you to ascend as high as possible?" Djeru looked to me with a growing anger, tinged with disgust. "We all know the price of the Trials, the limits and potential of our own abilities, the strengths and weaknesses of our brothers and sisters. We climb to achieve the best station in the Afterlife. And we will surely need you in the challenges to come." Djeru turned to the four prepared to step up on the pillars. "Brothers, sister. We will see you in the Afterlife." The four looked to each other, then as one, climbed onto their pillars. Immediately, the pillars began to sink into the ground as a grand doorway on the far side of the room opened. At the same time, however, other massive panels along the walls slid slowly open, revealing the shadows and shapes of terrible beasts that stirred at the sound of grinding stone. Behind us, I saw the snapping jaws of the ammit poke out from the corridor, shards of stone chipping away as it pressed and squeezed through. The rest of us ran toward the exit. As we crossed into the chamber beyond, we turned back in time to see the four step off the pillars, weapons drawn. Immediately, the massive stone door began to slide closed, shutting out my fleeting, foolish hope that they could perhaps still make it across to join us. We watched as they disappeared, the ammit charging toward them even as shadowy shapes of other monstrosities slinked along the edges of the room. We all stood, catching our breath for just a moment. And then we turned and continued onward. Hours later, we'd finally reached the top tier of the pyramid. This chamber was the largest and most grand of them all, every surface gilded and lit with an uncountable number of bronze braziers. Bontu herself sat in attendance upon a throne, attended by viziers and looking down at us from a series of stairs that led to her presence. Behind her, three large doors, sealed with metal and the cryptic writing of Amonkhet, gleamed in the flickering firelight. A clear pool of water separated us near the entry from where Bontu sat, a chilling reminder of the first challenge of the Trial. We were now nine. So many rooms, each designed to have more left behind. Some we battered our way through, making it across intact. But more often, the room battered through us, taking lives despite our best efforts and abilities. As we stood before Bontu, we were anything but victorious. Meris retched, red-eyed, bleeding from bites on his arm. In the very last room, flesh-eating scarabs had poured out the walls, devouring Imi, who had stumbled as we scrabbled up an impossibly high wall to the exit. Her arm came off when Meris tried to pull her free. Djeru had to haul him out. "You have kept me waiting," Bontu hissed in displeasure. Sighs of relief that we had made it cut short as we looked around the empty hall. Racks of weapons, clear pools of water. Upon closer inspection, I noticed dark, sinuous shapes rippling beneath the surface. "Water serpents," Kamat said, seeing my gaze. "Poisonous." Looking at the pools, I also now saw that beneath the water, a bridge stretched between where we stood and the platform Bontu occupied. However, where the walkway should begin, there was only a set of scales. After a painful, pregnant pause, Djeru spoke up. "Have we not completed your Trial, Great Bontu? What is left for us to do to earn your favor?" The great lizard blinked her double eyelids, and pointed to the scales. "Only those who can pay my toll may cross." "What is this toll?" I asked. Long ivory teeth. "One heart." "For all of us?" Djeru asked. "We can—"
I swallowed hard. The members of the crop stared around at each other. I saw hands inch toward weapons. "Surely, Bontu, we have lost enough to prove ourselves to you," I said. Mighty eyes narrowed. "The Hours draw nigh. Your numbers are too great. Pay the toll, or fall short and perish." I stared at Bontu, stunned. Our numbers are too great? A startled cry rang out. I turned, horrified, and watched an initiate fall, Neit's dagger in his back. With a few bloody hacks, Neit was charging across toward the scales, cupping red hands to her chest. Kamat slithered forward, tail lashing out, and Neit fell. Basetha dashed forward as Kamat and Neit struggled, scooping up the dropped prize, and slammed it onto the scales. The glittering footbridge rose, allowing her to cross over the snake-infested waters. I watched her kneel at Bontu's feet, and at the nod of the god's head, the viziers handed her a cartouche. The room smelled of wet earth, thick and unpleasant. An arrow flew toward me and shattered off my skin, which was again rippling with golden light. I turned in time to see Tarik collapse, dropping his bow as Nassor smashed his head in, the minotaur's cudgel crunching through bone. As Nassor drew a knife from his hip to claim his prize, Neit rose, slippery naga heart clenched in her hands. All of it happened in silence. No screams, no shouts of command, just the occasional clang of metal on metal, or blade sinking into flesh. Each fight ended in a flurry, one or two exchanges of blows—each combatant knowing all the other's tricks. I stood frozen in the center of the madness, occasional gleams of gold rippling across my skin. Sudden words shattered the silence. Djeru and Meris faced each other, hands on weapons, a calm in a storm. "I won't kill you," Meris said. "You're my brother." He laughed. "As if I even could . . ."
Djeru looked about. "I can't protect you from the others." Meris smiled sadly. "The answer's obvious." Djeru dropped his hand from his blade, walked up to Meris, and embraced the boy. "I'll make it painless, brother." Meris returned the embrace. "Look for me in paradise." The other clashes quieted as victors emerged. Soon, all eyes lingered on the pair. Djeru pulled back from the embrace, looked Meris in the eyes, and smiled. Then he shoved him into the water. Immediately, the dark shapes of the poisonous snakes converged on Meris. As Meris floundered to the surface, Djeru ran forward, holding him under. "No!" I cried out, charging forward. Two initiates, hands bloody and red, grabbed my arms, trying to stop me. I dragged them forward, straining toward Djeru—until I felt all energy drain from my limbs. I looked up, my eyes catching the infinite gaze of Bontu, her slitted pupils fixed on me. Watch, Kytheon Iora. Quiet your judgment, and learn. 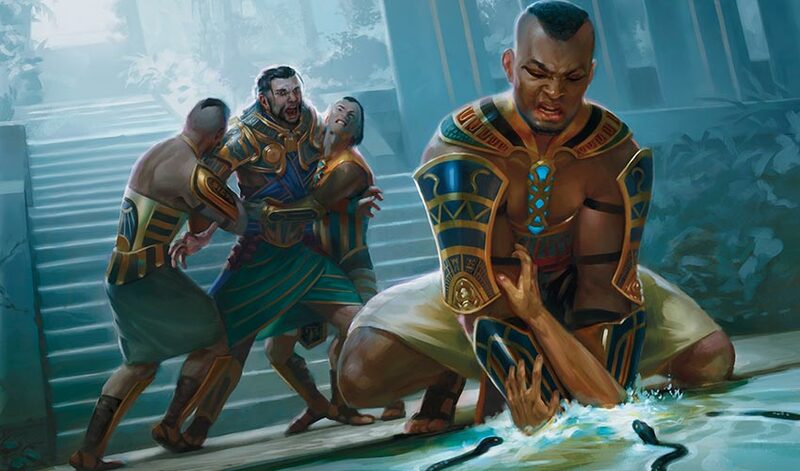 I fell limp in the hold of the two initiates, helplessly watching as Djeru drowned his brother. I realized he was muttering words as Meris thrashed. "Rest, brother, in the cool of the water, in the eternal calm of death. You have come far, and I do this now to preserve your body whole, unbroken and unblemished, only temporarily stilled by poison and the weight of water in your lungs. May the Hours arrive soon, and may the God-Pharaoh return to bring us all into the Afterlife." Djeru's voice cracked as his incantation finished and Meris's struggles waned. I dropped to my knees, and the initiates on either side released me, moving to retrieve their hard-won hearts. Djeru pulled the body of Meris from the water, panting. "'The worthy strive for greatness.'" he whispered. "'Supremacy will be rewarded in the Afterlife.'" He plunged his knife into Meris, teeth gritted. As he cut, the other victors walked toward the scales, one by one plopping their payment on the golden plate. Djeru was last to cross, Meris's heart dripping in his hands. He crossed the bridge, head held high, trying to hide the quiet tremble in his hands. The bridge sank quietly into the water as he reached Bontu, kneeling to receive his cartouche. Anger bubbled inside me. Not at Djeru, not at the others—but at Bontu, and Oketra as well. I stood, my hands balled into fists. "What am I to learn from this?" I bellowed across the chamber. My voice echoed off the cold stone stairs. Shadows flickered as the flames in the braziers sputtered. All eyes turned toward me. "Is this what you wanted me to see? That you demand the slaughter of the innocent? What purpose are these deaths to serve? What mockery of faith and divinity is this madness?" I ignored the mounting shouts of protest from Bontu's viziers and dove into the water. As I swam across toward the platform, the snakes swarmed me, but my skin flashed gold and they reeled away with broken fangs. I dragged myself out and stood before the god, glaring up. Bontu's viziers stepped forward, arms raised in defensive stances, magic dancing across fingertips. But Bontu raised a hand. She peered down her snout at me, her figure looming above. I ignored the looks of horror and outrage from the remnants of the crop. "You have not paid your toll," Bontu rasped. "Here." I pounded a fist against my chest. "Come take it." Bontu hissed a laugh, a wheezing sound that grew to a great crescendo. "And yet, still so ignorant of our world." "You speak the words of a heretic," Djeru said. His voice trembled with a mix of rage and anguish. "You would question our faith and our ways—you are no better than Samut." "He is no heretic," Bontu hissed, "for he has yet to find his faith." "You embarked on my Trial to find answers, Kytheon Iora. But you forgot to ask the right questions." Bontu stood from her throne, her figure towering above us. "You've seen more of us, what we demand." Another hissing laugh escaped her fangs. "Only excellence. True ambition. And yet, rather than understanding, I see only judgment in your heart." The slow lizard blink of her eyes. The feeling that she, too, saw right through me. I stumbled for words, instead turning to the initiates. "How do you all not doubt? Doubt the need of these endless deaths? Doubt this promise of your God-Pharaoh? What if he is not what he has promised? What if—"
"Enough heresies!" Djeru cut me off, drawing his khopesh. The other initiates stalked closer, but again, Bontu's voice halted us. She pointed a finger toward me, and I felt my breath escape my lungs. I gasped for air as her words pierced through me. "You look only for what satisfies your sense of justice. Your ambitions end with vindication for your past hubris." I looked to the other initiates to find hardened stares and accusing eyes. I stood, frozen and unable to breathe, and Bontu's voice echoed in my head for me to hear alone. Such a long quest for faith, Kytheon Iora, and still you know nothing of it. Of course they doubt. Doubt is the necessary shadow to the light of faith, Kytheon. The stronger the faith, the deeper the shadows of uncertainty. Yet still, their ambitions drive them to shine brighter, reach higher, unsatisfied by complacent divinity. When will you be able to say the same for yourself? Her mouth curved into a smile. "They are mine, and I am the God-Pharaoh's." "May his return come quickly, and may we be found worthy!" Initiates and viziers alike shouted as one voice. Bontu turned away from me and I fell to my knees, coughing, air rushing back into my lungs. The power of the command vibrated through my very core, and I found myself walking unimpeded, the others parting to watch me pass. I exited through the lowest gate behind Bontu's throne, and everything floated in a haze until I was outside again, washed in the red glow of the second sun. I looked up. It appeared closer than ever toward its final position between the horns. And I've moved ever further from understanding. This world. Myself. The sound of shuffling steps drew my attention. A stream of anointed also exited Bontu's temple, carrying out a procession of the dead, now wrapped in white gauze. The realization slowly dawned on me. The anointed are the remnants of initiates fallen in battle. The missing limbs. The quiet servitude. The stunted cartouches they wore. Is their unlife a gift or slavery? 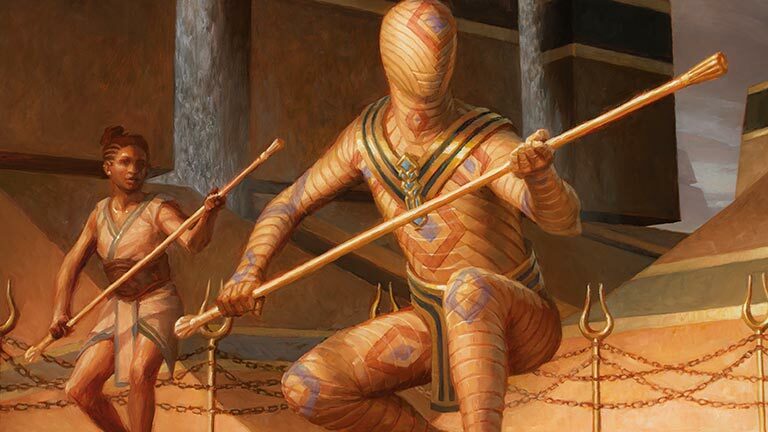 Are the gods good or corrupt extensions of Nicol Bolas? Is the viciousness of the Trials a dark perversion of a world? Or is death truly the highest calling on a plane where all ends in undeath? 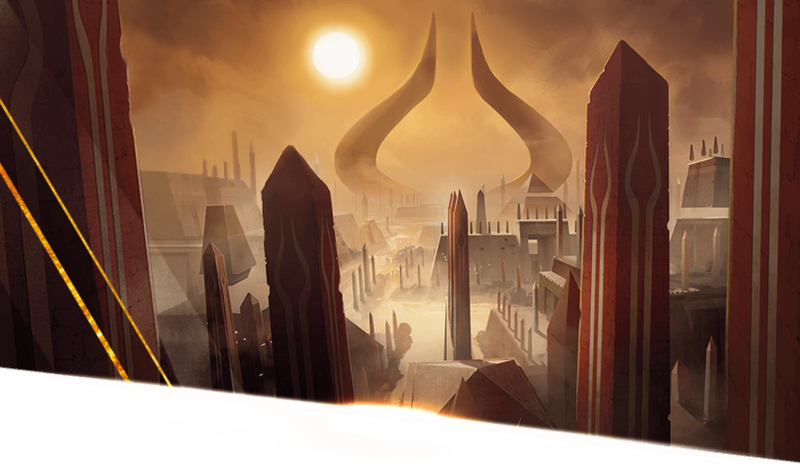 Overhead, the red sun plodded its inevitable steps toward Bolas's arrival and return. The God-Pharaoh's return. The mantra echoed in my mind. May he return quickly, and may I be found worthy. My fingers wrapped into fists. I tore the cartouche from my neck, dropping it on the ground before me. Worthy to strike him down.